Some of you may have noticed that I’ve been engaging in a bit of lively back and forth with one reader over my 2008 Yom Kippur sermon on Iran. I haven’t posted on Iran in some time, but that certainly doesn’t mean I’m not following developments there with great interest. 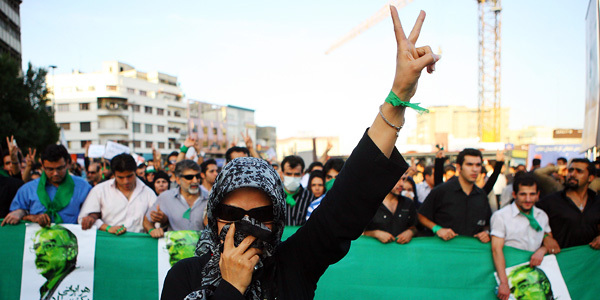 I do believe the Islamic regime’s increasingly brutal crackdown on human rights is a sign that it is taking the challenge of the Green Movement very, very seriously. For our part, the the US administration appears somewhat paralyzed – issuing tepid statements, wary of throwing too much support to the Greens lest they get accused of meddling in Iranian politics yet again. Meanwhile, the regime-change drumbeats of the right continue to grow ominously louder and louder. Still, it would be mistaken and foolhardy to assume the only choice we have is between doing nothing and doing too much. In this regard, I commend to you this very insightful and helpful article by Dr. Trita Parsi and Alireza Nader of the National Iranian American Council. (Between) the extremes of doing nothing and doing everything, there is a middle ground: providing the Iranian pro-democracy movement with breathing space, rather than engaging in risky and imprecise exercises that would directly involve America as an actor on the Iranian scene. The United States can achieve this through a few simple steps. Finally, Washington should exercise patience and view Iran as a long-term factor in shaping U.S. national security interests across the Middle East. The green movement will not and cannot adjust its action plan to suit the U.S. political timetable. But if patience is granted – which includes avoiding a singular focus on the nuclear issue at the expense of all other considerations – Washington will access a far greater potential for change. This entry was posted in Human Rights, Iran, Islam, Politics on February 17, 2010 by Rabbi Brant Rosen. Let us not forget that the first democratically elected Prime Minister of Iran in 1951 was Dr. Mohammed Mossadegh. Mossadegh was overthrown in Operation Ajax, a British and American sponsored coup, in order to basically secure oil ties after Mossadegh nationalized the countries resource. If anything U.S. government needs to keep negotiation lines open, but should not be a direct mediator in any way. The presence of non-state actors such as foreign press, and human rights groups will have a large influence on the outcome of this political headlock.